A blend of natural ingredients reputed to treat dry skin by deeply moisturising and therefore prevent irritation, itching or soreness. Dry Skin Oil is an aromatherapy massage treatment containing a blend of natural ingredients reputed to treat dry skin by deeply moisturising and therefore prevent irritation, itching or soreness. Dry Skin Oil can be simply used as a natural moisturiser by massaging into the skin. Using a clean cotton wool ball dab some oil onto the face or body and massage in. This will prevent using excessive amounts and your oil will last a lot longer. To lock in more moisture it is great to use whilst the skin is slightly moist after showering or bathing. 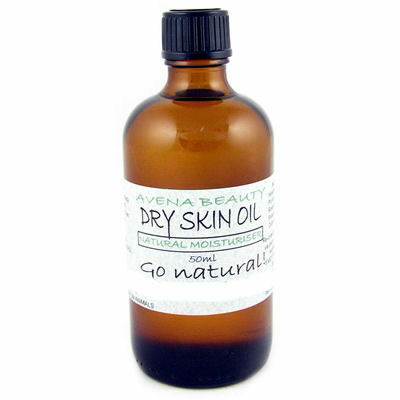 Dry Skin Oil is very popular and we have had some great customer feedback when used on eczema. To use on eczema or dry skin patches dab onto the affected area and gently massage in. This product contains only natural ingredients with no chemical additives. It is paraben and SLS free. None of our products are tested on animals.